Aged 56, is the founder of the LI-NING brand and the Group's Executive Chairman, Interim Chief Executive Officer and an executive Director, he is also a member of the nomination committee of the Company. Mr. Li has been appointed as interim chief executive officer of the Company with effect from 18 March 2015 and the duties of Chief Executive Officer has been performed by Mr. Li and supported by the incumbent senior management of the Company. He is primarily responsible for formulating the Group's overall corporate strategies and planning. Mr. Li is one of the most outstanding athletes in the 20th century. In the 6th World Cup Gymnastics Competition in 1982, Mr. Li unprecedentedly won six gold medals in men's artistic gymnastics events and was named the "Prince of Gymnastics" (體操王子) in the PRC. In the 23rd Los Angeles Olympic Games in 1984, Mr. Li won three gold, two silver and one bronze medals, making him the athlete winning the most medals of that Olympic Games. In 1987, Mr. Li became the Asian member of the Athlete's Commission of the International Olympic Committee. From 1993 to 2000, Mr. Li served as a member of the Men's Artistic Gymnastics Technical Committee of the Federation Internationale De Gymnastique. He is currently an honorary member of the Federation Internationale De Gymnastique. In 1999, Mr. Li was voted one of the "World's Most Excellent Athletes in the 20th Century" by the World Sports Correspondent Association. After retiring from his athlete career in 1989, Mr. Li initiated the idea of LI-NING brand with the goal of creating the first national sports goods brand in the PRC. He has dedicated the past over 20 years to the development of the Group's business, making great contribution to the development of the sporting goods industry in China. Mr. Li also serves as chairman, chief executive officer and executive director of Viva China Holdings Limited, a company which is listed on the GEM of Hong Kong Stock Exchange. Mr. Li holds a bachelor's degree in law from School of Law of Peking University (北京大學), an executive M.B.A. degree from Guanghua School of Management of Peking University (北京大學光華管理學院), a technical honorary doctorate from Loughborough University in the United Kingdom and a degree of Doctor of Humanities honoris causa of The Hong Kong Polytechnic University. In June 2010, Mr. Li was also conferred honorary fellowship from The Hong Kong University of Science and Technology. 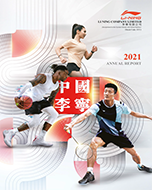 Mr. Li has also been actively involved in charities via his "Li Ning Foundation" (李寧基金) and his genuine support to the active and retired Chinese athletes and coaches in establishing "The Chinese Athletes Educational Foundation" (中國運動員教育基金), which aims at providing subsidies for further education and trainings for athletes and to support educational development in impoverished and remote areas in China. In October 2009, Mr. Li was appointed by The United Nations World Food Programme (WFP) as "WFP Goodwill Ambassador against Hunger". Mr. Li is the uncle of Mr. Li Qilin, an executive Director of the Company, and he is also the brother of Mr. Li Chun, a substantial shareholder of the Company as defined in the SFO. Aged 32, is an executive Director and a member of remuneration committee of the Company. Mr. Li joined the Group in December 2017 as a non-executive Director and re-designated as an executive Director with effect from 19 June 2018. He has considerable experience in financial services industry and was an analyst of Persistent Asset Management Limited during the period from January 2010 to July 2013. Mr. Li serves as an executive director and a member of the executive committee of Viva China Holdings Limited, a company which is listed on the GEM of Hong Kong Stock Exchange and is a substantial shareholder of the Company. Mr. Li is the nephew of Mr. Li Ning, the Executive Chairman and Interim Chief Executive Officer of the Company, and he is also the son of Mr. Li Chun, a substantial shareholder of the Company as defined in the SFO.